Tomorrow night will mark the end to one of the greatest TV shows ever. The final episode of ‘Breaking Bad’ is titled “Felina“, which spurred Andi Teran to write an in-depth theory on how the show will wrap up. First off, the title Felina can be interpreted several ways. On the periodic table of elements Fe stands for Iron, Li stands for Lithium, and Na stands for Sodium. Besides the chemistry reference, what else could FeLiNa mean? Blood, Meth, and Tears?!? Felina is also an anagram of finale. Andi Teran’s theory revolves around the Marty Robbins’ song, El Paso. The song is all about a cowboy who falls in love with a Mexican girl named Feleena. Give it a listen. As Kotaku remarked, “the song is loaded with very Breaking Bad-ish lyrics”. After reading the entire theory, I’m almost positive the song will play at some point in tomorrow’s episode – it’s too perfect. 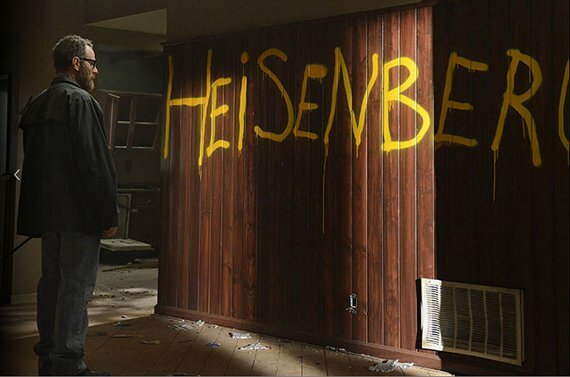 Felina symbolizes Walt’s dark side, his pride, his ego, his ambition — Heisenberg. Just like the cowboy’s self-defeating quest for Felina, Walt knows his pursuit of money, power, and revenge will ultimately lead to his demise. In addition to Walt’s dark side, Felina is an actual character in the show. Who is the “Felina” in the series finale? Is she related to the Felina of “El Paso”? Is she a whirling feline dervish with a wicked glint in her eye? Is she both the ruin and the savior of our wayward cowboy? This is a totally crackpot theory, but what if “Felina” is Marie (Betsy Brandt)? 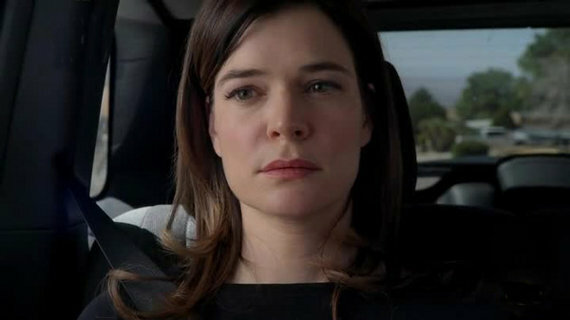 In Sunday’s episode, Marie stares out the window of a police vehicle. She’s in protective custody, being driven home in the wake of Hank’s death, only she doesn’t get to go home and is whisked away when her escorts discover that her house has been broken into. If anyone on Breaking Bad has truly lost everything as a result of Walter White’s choices, it’s Marie. She’s lost her husband, her sister, and now her home. She is alone, swathed in black, and no longer comforted by the warm violets of her environs. Interestingly, in desert gemology, the color purple signifies purpose. And if anyone deserves a shot at Walt — possibly more than Skyler and Jesse — it’s Marie, the only utterly blameless victim in this whole mess. To add to the schizophrenia, Marie’s maiden name is Lambert and Walt’s identity while in hiding in New Hampshire was Mr. Lambert. Here’s what I’m predicting. Prediction #1: Marty Robbins’ El Paso or a cover of the song will play at some point in Breaking Bad’s finale. Prediction #2: Walt will be shot, get away, and then someone else (probably Marie) will finish him off. Prediction #3: Though not discussed in the above theory, I believe one of Walt’s kids will not survive the final episode. Read Andi Teran’s theory in its entirety and gear up for a wild west shoot out tomorrow night.